The Well L96 Compact Bolt Action Sniper Rifle is a durable and affordable airsoft gun for those looking to fill the role of the sniper. Externally, the Well L96 Bolt Action Sniper Rifle features a polymer stock and metal barrel and trigger assembly. The buttpad and cheek rest are adjustable to provide the shooter with comfort and proper eye relief when shooting their rifle. The trigger mechanism is light, similar to the zero trigger system, making follow up shots quick and easy. Overall, this is a lightweight and affordable sniper rifle for those who prefer to engage at a distance without having to break the bank. The tan color of this gun will also help when operating in dry earth or desert environments by blending in with the surrounding colors. 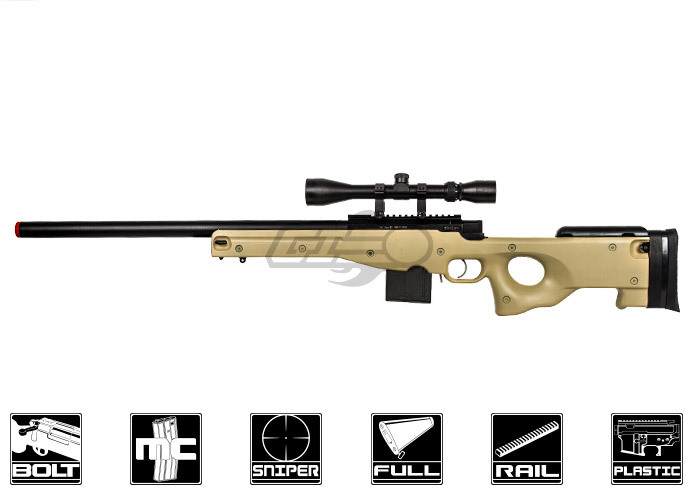 Well L96 Compact Bolt Action Sniper Rifle Airsoft Gun ( Tan, Scope Package Deal ) is a good beginner sniper. If your new to sniping like me. Its heavy,30 rds and easy to assemble.I cant wait to take this sniper out for a spin. Comes with speed reloader and sling. What specific bipod would I buy for this because I don't see where it would attach? Also what size of BB's should I use? A replica Harris bipod would attach to the small loop in the front of the gun, or you can use a rail attachment to add another bipod. I own one of these guns, and finding a magazine has been somewhat troublesome. You guys offer a Magazine that says WELL L96 30 round Magazine, But one of the question stated was answered with "we don't believe this will work." While digging around the other colors of this gun, someone asked for extra mags, and was answered with "We're selling them here:" then provided a link to the mag. What I'm asking is, Will The 30 round mag work? Or will it not? Thanks, I hope I get a reply.